So unemployment is supposedly down .2%, but most figures are unchanged? As I like to do monthly, let’s unpackage this little enigma shall we? First of all, we’re down quite a bit to start with. Remember this headline from last month? That’s our first factor. Some of it was just a really bad prior few months. We have to dig out of THAT before we can get actual “growth” from where we were even a year ago. And that was WAY below where we should be. 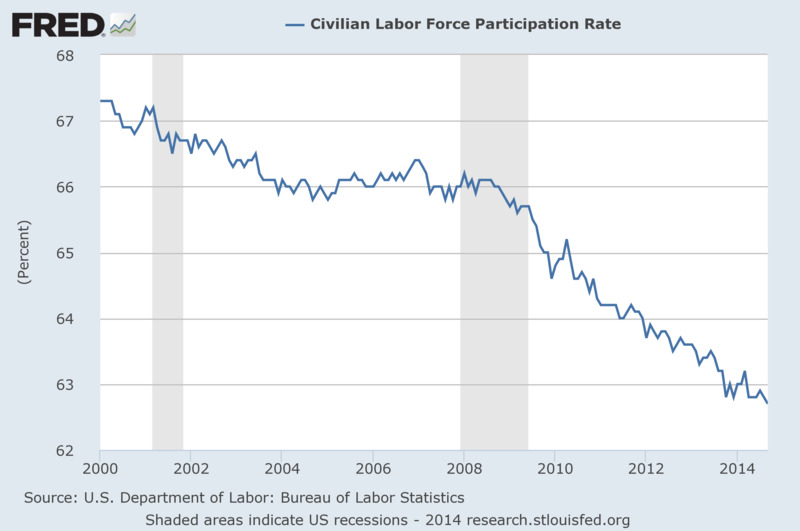 Second, I know I keep harping on this but the Labor Participation Rate is down again. Now it’s at 62.7%. In 2008 it was at 66% and that wasn’t particularly high, but more of a low-average. Again, I say this all the time but for the new people… if you quit you’re not “unemployed.” After all, you quit. So… no unemployment check for you! If you don’t collect an unemployment check you aren’t “unemployed.” You simply don’t exist. If you get fired and don’t collect unemployment… you don’t exist either. If you raise a family and don’t work outside the home… you don’t exist. Third, the figures aren’t exact. They generally have at least a .1% variance at the best of times. So, we’re within the margin of error most of the time. So add that up now. We were below even the anemic level we were this spring. That .1% is to catch up to where we were in the summer. They’re “hiding” more potential workers by making them “disappear” off the rolls. That’s another .1%. Best guess is we’ve broken even this month. However, I’m gonna call this one a draw. We didn’t really lose ground. We just didn’t do as well as they SAY we are. Generally you need an unadjusted 300,000 new jobs to break even* and a solid 500,000 more jobs a month for many months in a row to show TRUE growth. * Figuring a 2.4% yearly increase in population, that’s roughly a .2% growth in jobs every month just to keep up with the extra people born and immigrating to this country. I know, I know. “Well what would you be happy with?” For starters, a solid 500,000 new jobs per month for a year. Also a RISING Workforce Participation Rate. Over 66% would be nice. If you satisfy those two requirements, it doesn’t matter what the unemployment rate does. We will have more people working, and that’s all I care about. The only dip here is the American people who believe this. Part time jobs and boomers retiring is the real item here. Also the figures don’t truly track “people.” They track “jobs.” So one person with two part time jobs equals two “workers.” Makes it seem like the people working is higher than it us. Good thing for the politicians that 80% of jobs since 2008 are part time huh?